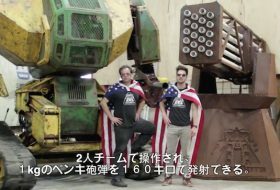 A little background: the Japanese made this sweet robot battle mech. Not for any other reason than it’s pretty cool. Well, some Americans have done the same thing and they want the next logical step: a robot battle. We doubt it’ll happen, but man, we can dream.